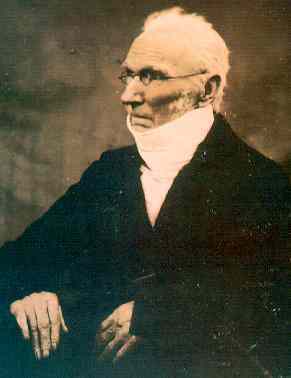 Patrick Bronte was born at Emdale, in Ireland, on 17th March 1777. A tall and slim man with red hair, Patrick was the eldest of 10 children of Hugh Brunty, an agricultural labourer, and his wife Eleanor (also called Alice) McClory. His family was poor and initially, he was apprenticed to a blacksmith and then to a linen weaver. But Patrick was an intelligent man who showed aptitude towards education, a love for literature and was self-taught in many subjects. This allowed him, by sixteen, to become Master of the village school. He then was also helped in his education by local clergymen, Revs. Andrew Harshaw and Thomas Tighe. In 1802, Patrick entered St John’s College, Cambridge. This was no small achievement considering the modest financial means of his family. It was also during this time that he changed the spelling of his name from Brunty to Bronte. No one knows for certain why he did this. Maybe he wanted to hide his humble origins? But what does Bronte mean? It is the name of a Greek god and means thunder, but he could also have chosen the name in honour of Lord Nelson, on which was bestowed the honour of Duke of Bronte by King Ferdinand of Naples. Patrick graduated from college in 1806. After his graduation he went to Ireland to see his family. That was the last time he ever set foot on Ireland. The following year he was ordained into the Church of England and then held several curacies. In 1812, Patrick met Maria Branwell. The couple married in December of that same year and had six children: Maria (1814), Elizabeth (1815), Charlotte (1816), Brawell (1817), Emily (1818) and Anne (1820). The year his younger daughter was born, he was appointed perpetual curate of Haworth. His wife Maria died here of cancer the following year. Maria’s sister Elizabeth moved in with the Brontes to assist her during her illness and decided to stay even after her death to help Patrick take care of his many children. Struggling to bring up his large family and failing to remarry to give a mother to his children, in 1823 he decided to send his four eldest daughters – Maria, Elizabeth, Charlotte and Emily – to the Cowan Bridge school, a school for clergymen’s daughters. During their second year there, Maria and Elizabeth contracted tuberculosis and died. Charlotte blamed the harsh regimen and the poor sanitary condition of the school for their death. After that, he personally took charge of his children’s education. Patrick Bronte campaigned on a wide range of political, social and religious issues, including the improvement of education and water supply in his district. His work paid off as he saw a change in education and sanitation for local people in his lifetime. In the last years of his life, after a series a tragedies had befallen his family (his wife and all his children died before him), he became a recluse. His eyesight deteriorated and the dyspepsia and bronchitis, two conditions he had been suffering from all his adult life, contributed to his death. He died on 7th June 1861, aged 84. His body was laid to rest in the family vault at Haworth church.